So exactly 7 days ago I ran my first 5k. I did well for me. I ran 36.24! I had set a goal for myself of 36 minutes. Then as I got closer and it seemed I was clocking closer to 40 mins in training I back my goal to 40 mins. I wanted to push myself but not discourage myself. I also most hit my original goal! I didn't use my iPhone during the run so I was running blind. There weren't any markers for how far I had gone. We finished on a track so I knew I only had 1/4 a of mile left and I kicked into high gear for my finish. I felt so good! I really couldn't believe how well I did. I'm hooked. I want to train up to a 10k, half marathon and eventually in the future a marathon. I love the accomplishment I feel when I finish. I love setting a goal for the run and then meeting it. I don't think I'll ever be a fast runner but I am a runner. I've been a bit MIA from blogging lately. I've got a new part-time job plus I'm enjoying my life. I use to blog in my free time and now I'm running or running after my Ravebaby. Life is really good. Yesterday I had the chance to see The Hates, a punk rock group from Houston. I had a blast. 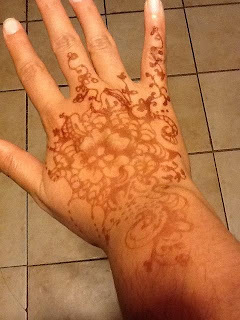 On Thursday, I got a henna tattoo, my first. I had been wanting one and then someone just up and offered to do them so that people could have them for The Hates show. I love it! Today is my birthday. I've had such a good year. I feel like I'm finally where I need to be. I'm not working myself to death for a paycheck. I'm reaching goals that only a few months ago seems impossible. What will this next year bring? God only knows. What do I want? I want a baby. This baby quest has a direct effect on want #2 which is to finish a 10k. Since I'm not running a 10k yet, I think a baby would derail the training but it's a derailment that I would gladly welcome. I want to continue to listen to the universe and to learn to keep going with the flow of life. I want a lot, don't I! I'm looking forward to seeing everything that comes my way.